Celebration cake – Dorothy’s 100th anniversary in 1997. Courtesy of the Maritime Museum of B.C. Last evening witnessed the launching of the yacht Dorothy, belonging to Mr. W. H. Langley, captain of the Victoria Yacht Club. There was quite a large number of interested spectators who cheered lustily as, after having been very gracefully christened by Mrs. A.J. Weaver-Bridgman, the little yacht took to the water in a series of lively and pretty leaps. Every credit for the success of the launch is due to her builder, Mr. J. Robinson. The Dorothy is a single-handed cruiser designed by Linton Hope of the Thames Yacht Building Company…Times Colonist, July 27th, 1897. As part of Victoria’s rising middle class that began to have time for leisure activities like sailing, Langley was eager to make his mark with a boat that was fast. He wrote to the designer of two yachts he liked the look of, and, after two years and many, many letters back and forth, Dorothy was born. 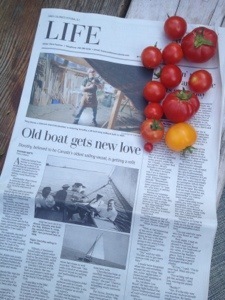 Little did he know that his “little yacht” would survive to be the oldest registered sailboat in Canada. The Victoria Yacht Club, Dorothy anchored at the far right. From A Century of Sailing. The reasons Dorothy outlasted all of her peers are many – sheer luck among them – but chiefly, it’s believed she’s still alive because she was actively sailed. A wooden boat needs time, care and a life on the water, and Dorothy had heaps of that during her 12 decades on the coast. But she had many near-failures too, surviving both World Wars, amateur repairs and periods of neglect, but somehow always seemed to pull through. Somehow, a champion always found her, fell in love with her lovely lines, and spent more time and energy than they had intended to keep her alive. Her list of owners is surprisingly short, beginning with Langley and ending with the Maritime Museum of B.C. Langley sold her in 1944 to Linton Saver of New Westminister, where she was entered into the Ship’s Registrar, and she remained in Vancouver under a quick succession of six owners, from Robert Minty, who renamed her “JimboJack”, to the brothers G.W. 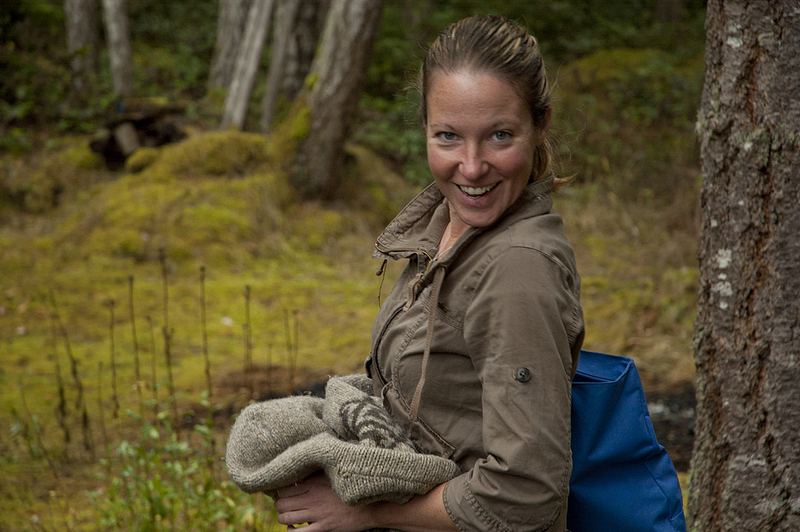 and Kirby Burnett, who sailed her with the Royal Vancouver Yacht Club. During this period she had an alcohol fire in her cockpit that nearly destroyed her. Finally, Phillip Harrison sold her in 1964 to a young pair of Victoria architects, Chuck and Pam Charlesworth, who brought the yacht back to her birthplace. Charlesworth’s daughter Jennifer remembers one particular sail when she and her father took Dorothy out alone, and he experienced such joy at the helm that she knew it had made all the years of repair and struggle worthwhile. Sandy and Angus Matthews, who courted Charlesworth in order to get first dibs should he ever decide to sell Dorothy, were her next custodians and they did work on her interior, re-did her decks and hatches, and got her a new suit of sails. David Baker and Su Russell completely reworked her rigging, parcelling and serving in the traditional way, and showed her at Expo ’86. Dorothy’s luck held, even after being sold to the owner of a private marina in Sidney who left her out in all weather and let freshwater get in her cockpit. She was restored again to sailing condition by Hugh Campbell of Winward Woods, and finally donated to the Maritime Museum of B.C. in 1995, sailing proudly as the flagship vessel for her 100th anniversary. Dorothy’s current “mid-life refit” is undoubtedly the most intensive restoration she has ever undergone. Still, Tony Grove, the shipwright tasked with the job, has only had to replace two garboard planks and a short aft plank. Dorothy is still 90% original wood – the same red cedar planks that were pulled from trees in the surrounding area have endured to this day, still soft and containing the magic malleability that good wood can still have after 120 years. It’s miraculous, in a way, that Dorothy has survived all these years, and yet not. She survived so long precisely because good, ordinary men and women offered their time and energy to preserve and lengthen the life of a beautiful, functional work of art. She is here because they were there for her. September 1982 off Brotchie Ledge at the entrance to Victoria Harbour. Alec (age 4) and Angus Matthews were sailing her to the Victoria Classic Boat Festival. Courtesy of Angus Matthews. Join us in underwriting Dorothy’s next chapter by making a tax-deductible charitable donation. Please contact Angus Matthews angus@angusmatthews.com to learn how you can make certain Dorothy will sail on into her next 120 years. Long may she continue to find her champions, to be stewarded with love, and to inspire people to head out to the sea. Forward floors and keel – done! So the question last May was, if he succeeded in pulling together this lap joint, would that adversely affect the structure built around it? And how could one go about pulling together such a massive gap? 1. The keel bolts and floor/straps holding the lap joint (which connects the keel and stem) were holding no more, and a gap incurred over time with the other repairs around it serving to maintain the gap. 2. The lap joint had spread apart over time and I wasn’t sure it could be pulled back into place. However, I came up with a plan to use two 3/4 in. bolts and a shackle threaded on the outside on either end of the lap joint, this allowed the use of a comealong to pull the 3/8 gap into place. Once this was accomplished I was pleased to see that all the pieces in that area fell nicely back into their original positions. 3. The floor timbers and floor straps all had various form of rot in the forward area around the lap joint. I replaced them with new white oak and that was steamed or cut into shape. The orange colour is just a red lead primer. 4. I then replaced the lap joint keel bolts up forward by first drilling bigger holes in where the original 1/2 in. iron bolts had been. The holes in the wood had enlarged from the old bolts and electrochemical decay. The new bolts are 5/8 in. silicon bronze. 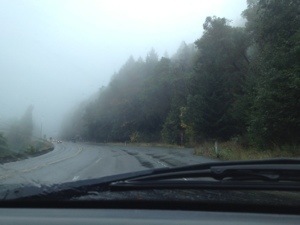 The 3/4 in. bronze bolt holding the forward end of the lead ballast was in good shape so was set back into the boat through a new floor timber. 5. The front end of the lead ballast used to have a wedge in to help fair it, and it must have been banged off at some point. That has been replaced with a new piece of white oak. So there you have it! One comealong, a few shackles and some bronze bolts later, Dorothy‘s forward area is coming together beautifully. You should come by and see her before she’s all sewn up. It’s going to go fast from this point forward as Tony dedicates himself to getting Dorothy finished this winter. After all, he’s going to need his shop back for the courses he’s teaching next spring and summer. 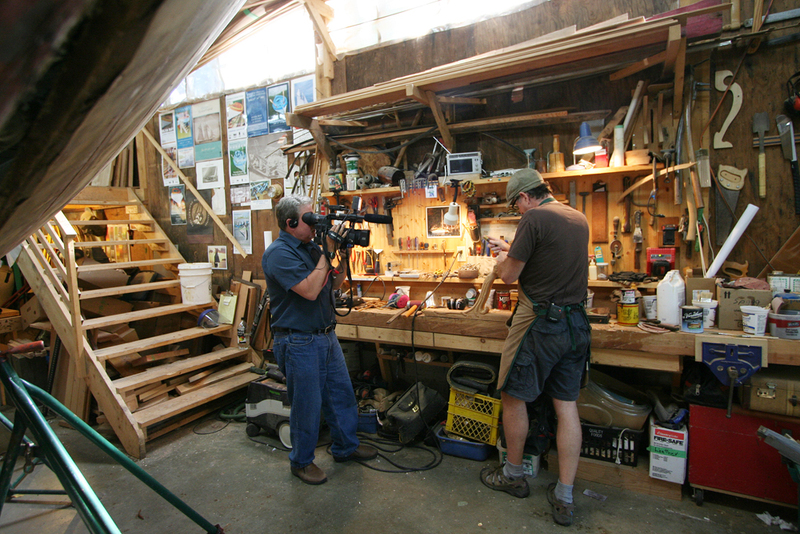 If you haven’t read up about the new adventures in “The Grove Woodworking School”, head on over to his website to find out what’s happening. Land-Ho! Campaign countdown party this Friday night! To celebrate the close to an amazing fundraiser for the documentary about Dorothy, join us this Friday at Artworks Gallery on Gabriola. Where: Artworks @ the Village, North Rd, Gabriola Island. What: Watch some Dorothy videos, listen to music by local musician Tim Harrison, enjoy some snacks and countdown with us a successful fundraising campaign for the local production of the documentary “Between Wood and Water” about Dorothy, Canada’s oldest sailboat. **Note: Some of the artwork by local artists and entrepreneurs that hasn’t been claimed during the campaign will be available for purchase by donation. Come and see what’s there, you might just find a perfect gift for Christmas, and can support this film at the same time. When I first learned that Tony Grove would be restoring Dorothy for the Maritime Museum of B.C., my immediate thought was, “Someone must document this!” But when I actually visited the MMBC and scanned through the treasure chest of supporting material chronicling her life on this coast – the photos, the wealth of logbook entries and letters of correspondence between her first owner, W.H. Langley, and her designer, Linton Hope – I realized this story could be much more than a documentary about the restoration process, it could be a wonderfully rich and substantial love story about sailing on this coast. 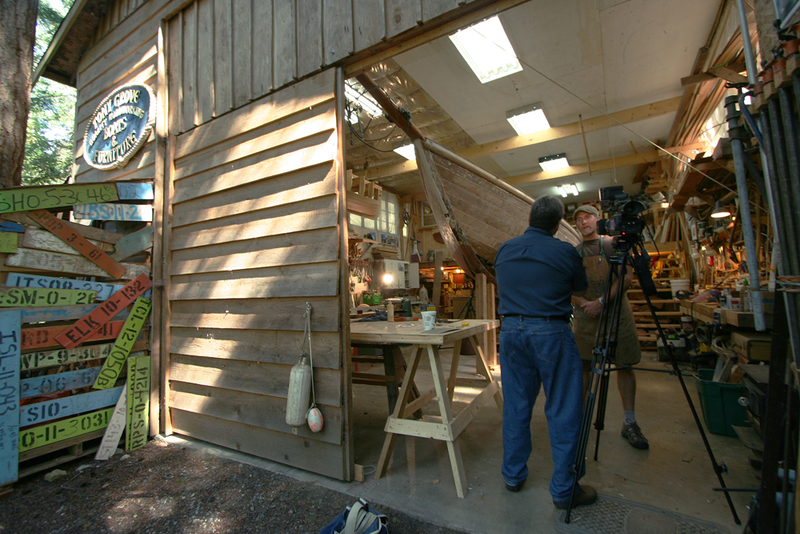 Now, to those of you who love watching how-to videos of wooden boat restorations, (forgive me if I’m wrong here) but if we only focused on the restoration drama that’s happening in Tony Grove’s shop, the rest of the world would quickly bored. There’s only so much sanding, scraping and plank replacing that one can watch! Although a “restoration documentary” would have its own narrative arc, we need to see why people are going to such lengths to save this boat. What is so compelling about Dorothy? Why has she survived this long? Truth is, a wooden boat doesn’t survive for over a century, with 80-90% of her original planking intact, by chance. She had to have had an extraordinary level of care throughout her life. Someone, at every point of her life, was either sailing her, saving her, restoring her or searching for a better steward for her care than they could presently give. That is what I love about the Dorothy story: the drama lies in those who sacrificed over the years to keep her alive and sailing. Even if you don’t have a sailboat, have never sailed, or don’t like boats or the water, you likely have something in your life that gives it added meaning and depth. Not only can we grow in character from learning attention and care, responsibility and stewardship from loving humans, but beautiful objects, too, can make us grow. We all need something to love. And the more you care for your lovely thing, whether it be a home, a guitar, a bike, or a VW Doc Bus! as my friend Mandy Leith can attest to, the more you learn how to keep your lovely thing in the best possibly condition, and the more your heart expands. By focussing on the romance and relationship between a beautiful, functional object (or being) that brings you joy, and you, as the human stewarding its care, I hope to make this story universally appealing. Don’t delay, if you have thought about contributing to the documentary but haven’t yet, we could use your help now! We are at $5,560 and need to raise $10,000 for vital shoots this summer and fall. Please spread the word and help make this campaign a success. Thank you! Work is again progressing on Dorothy, even as we run this campaign to fund the documentary. This week, Tony has picked up chisel and mallet (and all those other tools specific to boatbuilding that I can’t name here) to begin picking out the seams in earnest. He’s glad to get back to work on Dorothy again – and I must say, that after all the different skill sets I’ve had to pick up to run this kind of funding campaign, it’s frankly nice to pick up the camera again. I am, after all, a storyteller more than a campaigner! Yesterday, Tony got to remove a big patch on Dorothy‘s starboard side to see what lay below. 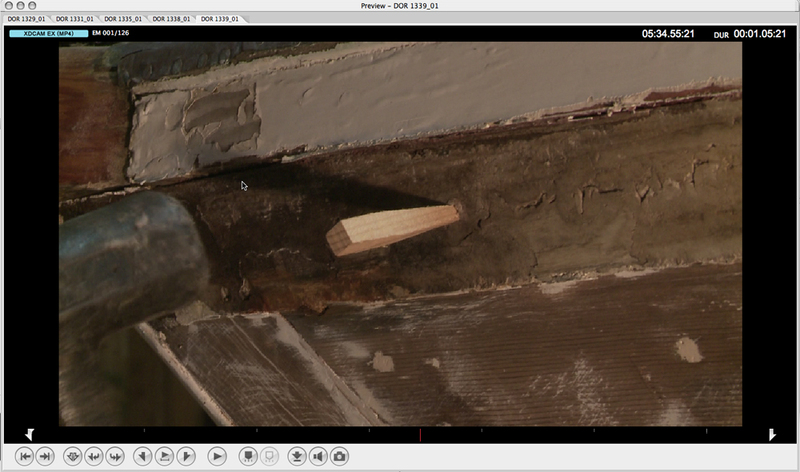 It was above the waterline and such an obvious repair that it stuck out like a sore thumb in every shoot we did. It was interesting to see what happened to the cotton and oakum caulking under that patch, relative to the still-intact caulking in the rest of her planks. Imagine – a twisted line of oakum and cotton with linseed oil pounded into these seams… lasting 116 years! It’s remarkable. But we can’t tell you here, you’ll have to wait for the documentary! Our fundraising campaign to be able to keep shooting this documentary is still on. 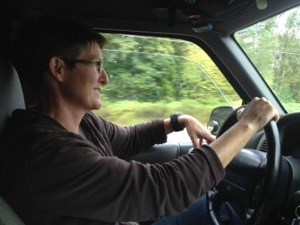 We have raised $2,115 so far – yay! – but it’s only 20% of our goal and we have 27 days to go! We need AT LEAST $10,000 to be able to continue into this winter and next summer, when Dorothy is re-launched in Victoria in summer 2014 to sail again. 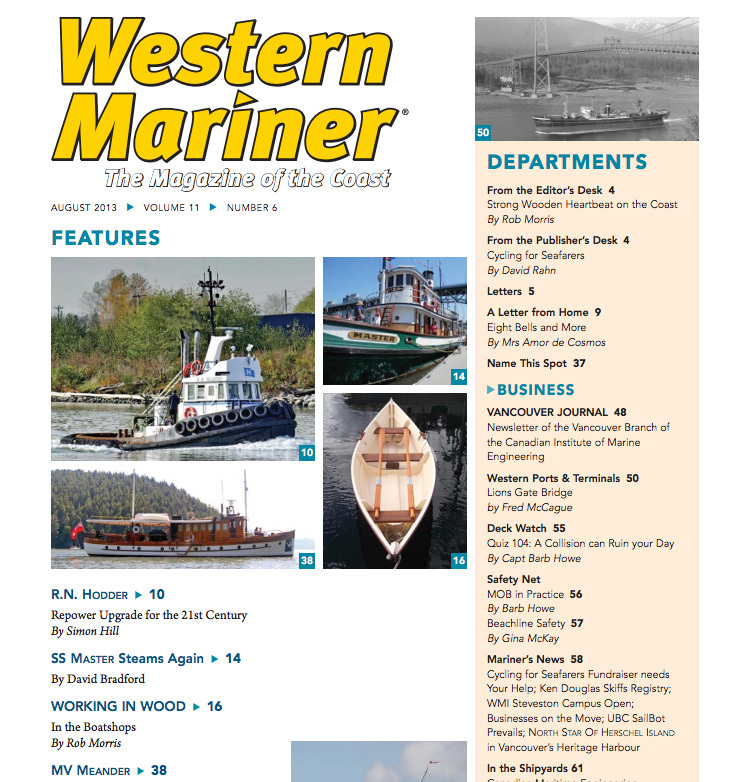 Please help us spread the word about this important historical documentary – and the story of the most beautiful boat on the west coast! Also don’t forget tomorrow is VIDEO FRIDAY, when we reveal a short clip from featuring either Tobi Elliott with a campaign update, or some footage from the film. Tune into this channel (http://www.youtube.com/user/telliottjournalist) to watch previous videos and to find out what’s on. So please pass the word around, share on your Facebook and blogs about the campaign. 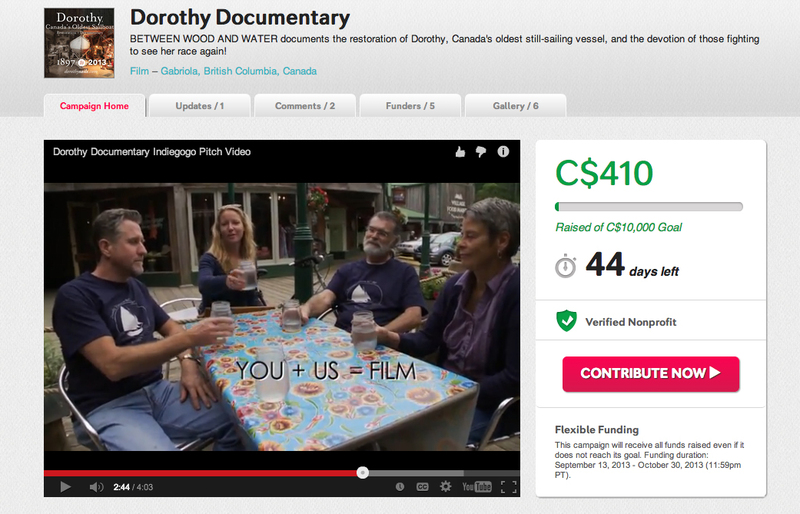 It’s really easy to donate at the site: http://www.indiegogo.com/projects/dorothy-documentary/ and it will help us hugely! Thank you! And… additional bonus, can anyone tell us the name of this traditional tool (or technique) used exclusively by boatbuilders? Email dorothysails [at] gmail [dot] com and your name will be entered in a draw for a prize at the end of the campaign! Dorothy Documentary fundraiser is live! We are just 5 days in to our online crowdfunding campaign for the documentary about Dorothy, and already we have 5 lovely donors! Thank you to all who have donated or spread the word – we couldn’t do this without you. We have done all we can to film up until now out of our own pockets and time. But a documentary of this depth – with archival images, the retelling of sailing stories from long-ago owners, and some real beauty shots to show the love of sailing on this coast – requires a serious treatment. And this is where YOU come in. Crowdfunding means many people (a “crowd”) from around the world each chip in a little to help meet a big goal. We don’t need a lot from each person, but we do need you to spread the word so a lot of people get on board. And then we can easily meet our goal! You can help us out with 4 really simple steps: 1. Watch the video; 2. Pick a perk (gift) at the level you want to donate, 3. “Contribute” and off you go! (You need only a credit card or Paypal account.) and then 5. SPREAD THE WORD. All funds go directly to production, making sure we don’t miss a beat in shooting this amazing story of Dorothy’s restoration, happening now on Gabriola Island. Off to see the Boats… the beautiful, beautiful boats! We’re off to the Classic boat festival this long weekend with a truck full of gear (see right- the exposed blimp and box of tee-shirts? 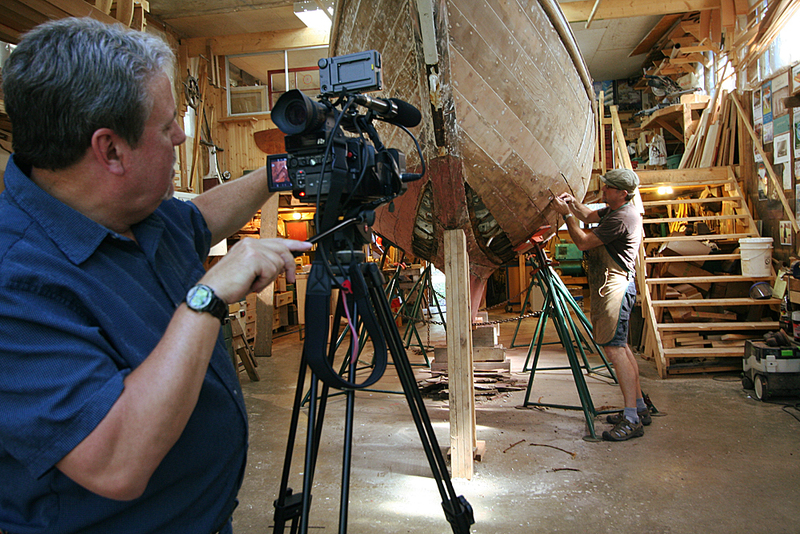 this is how movies are made…) to capture some magical boat shots and interviews with people CRAZY about wooden boats. This is the first shoot that isn’t totally Dorothy-focussed, and I think it’ll be nice to get some light touches and atmospheric colour for the film. Not everything has to be about Dorothy – does it? Owners of Dorothy in the 70s until 1984, they actively sailed her as a young family and did much to keep her alive. Angus confessed a secret about what he did for Dorothy while she was under his care – which Tony Grove said did much to keep her in good condition – which we have sworn not to reveal. But something we can tell you… It was Angus who provided Dorothy with the gift of a full suit of Fogh sails, which are waiting for her return to the water even now (thanks to his brother, an Olympic sailor who worked for Fogh.) We learned during our time with them this afternoon that it was apparently the first suit of gaff-rigged sails Fogue had ever done! Then, the photos came out. Oh my, there are some beautiful shots of Dorothy under sail like I’ve never seen before! They will for sure make the film. Can’t put them up yet as we left in such haste for the ferry that they will have to wait until after Victoria and Port Townsend boat shows. I’m personally so stoked to meet the many people who have written us or talked about hearing the Dorothy and are looking forward to the film. And we have some amazing volunteers who stepped forward to help us sell T-shirts (which fly out of the box whenever they come out) and enlist people in our doc film community – thank you especially to Harry Martin, a volunteer for the MMBC who has come over to see Dorothy a number of times and already has done so much for us in organizing help and volunteers. Thank you Harry! Thank you everyone who has stepped forward to help, or even give encouragement that they are eager to see the film. THIS is how films are made… as a team, for a community, with passion and diligence and no small amount of sweat and persistence. So thank you again. We can’t do this without you. And now, if you want a moment of levity, go to the Dorothy Documentary Indiegogo Kickoff party event on Facebook and look up the ridiculous video I posted yesterday to reveal the party location! It’s going to be an amazing event, full of artists who are donating beautiful work for the fundraiser, tapas by some incredible local chefs, music and dancing and oysters and Dark n’ Stormys, oh my! Please join, even if you can’t come personally, join virtually! Sign in and you can see my new video pitch for the film, get some photos of the action and download the dance mix curated by Bryan. It’s going to be a blast, so come if you can! 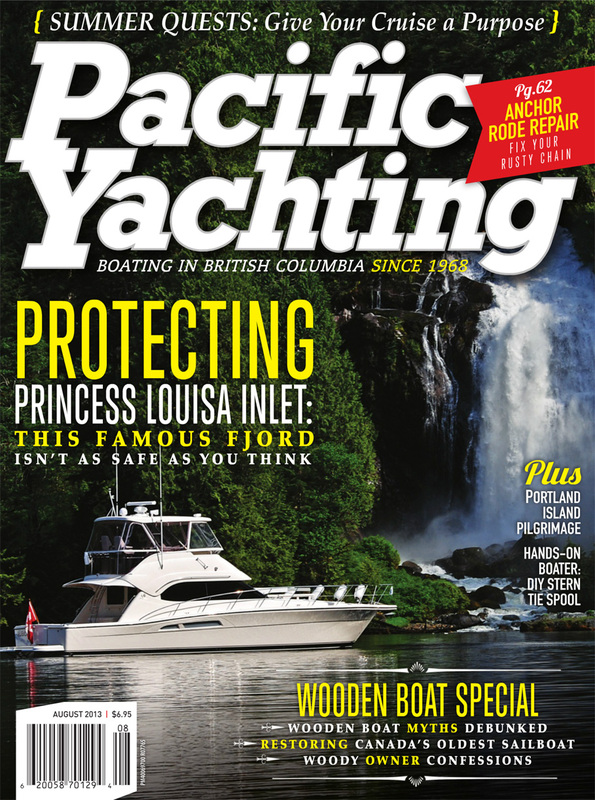 Over here at Dorothy restoration headquarters, we were pretty happy to read the lovely article on Dorothy’s restoration written up by Victoria’s Times Colonist today: “Old boat gets new love”, by Richard Watts. And he highlights the archaeological investigation into Dorothy‘s physical history, citing Tony’s surprise about the small construction details that differ from today’s methods. And… he quotes me saying something actually articulate nice about the “legacy of care” that has kept Dorothy alive all these years. So… nice read, and thanks Richard! I don’t know how many in the Victoria area got a chance to hear this morning’s LIVE interview with CBC Radio’s “On the Island” Morning show with Kahlil Aktar about Dorothy and the documentary I’m producing. It’s been awhile since my live radio hits in Dawson Creek, BC, as an Astral-Media reporter and there was sooo much in my head to talk about, that I’ll have to listen again to actually hear what came out of my mouth! Also, on Wednesday, a shooter for Global BC TV News showed up and the segment aired province-wide last night. Unfortunately, neither Tony Grove or I got to see it as neither of us has a TV hooked up to anything other than Netflix! So…. if anyone by incredible stroke of chance recorded the evening newscast, please let us know and we’ll get a courier to your doorstep ASAP! I’m eager to see what the videographer picked up as a storyline. The show producer might be able to send us the segment and I’ll post it here if that happens. Meantime, I did manage to make a recording of my interview this morning with Kahlil. Sorry it cuts off at the end but the only way I could get it from my phone to computer was trimming and emailing – iTunes apparently having a bug when it comes to transferring voice memos. Oh technology, how character-building it is when you fail us just when we need you…. Anyway, been nice chatting, meantime I have to get some work done – and so, probably, do you! Click here to listen to my CBC interview about ​Dorothy, the oldest sailboat in Canada, and my documentary Between Wood and Water on her restoration. Red letter day for Dorothy! 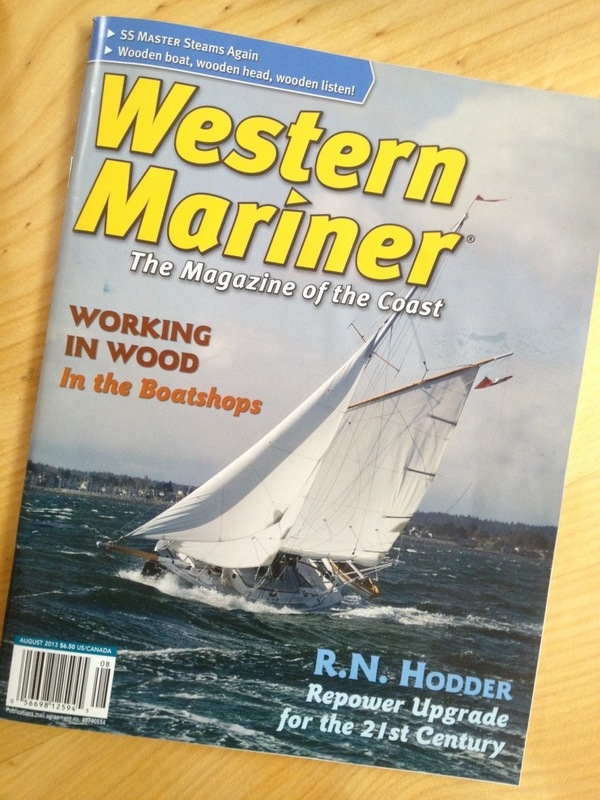 We are stoked to see Dorothy‘s story appear in two significant boating magazines, Pacific Yachting‘s August Wooden Boat Special, and Western Mariner (The Magazine of the Coast) in the “In the Boatshops” special section. Already people are writing to ask how they can support the documentary. Pick up a copy at your nearby magazine stand, and write and tell us what you think!